Easter is this Sunday. With the arrival of the hated Daylight Savings Time, days are getting longer and warmer and we’re all busy with family, friends, and our own stuff. This Easter Cheesecake recipe is quick and easy and so scrumptious you might want to forego using a fork and grab a spoon instead to get every last yummy bite. Total Time: 3 hr. 10 min. 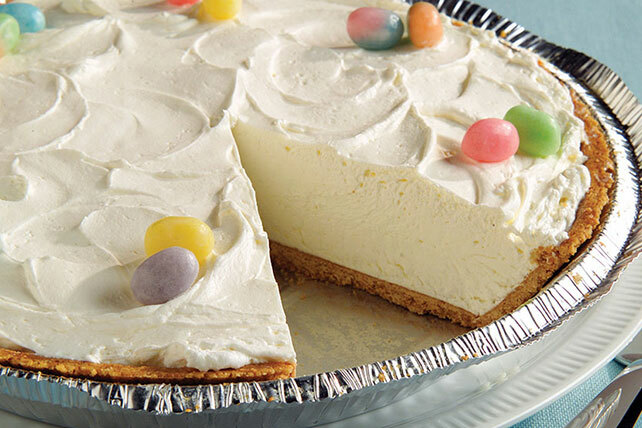 Try a Fluffy 2-Step Easter Cheesecake in a graham cracker crust for a great springtime treat. Top this Easter cheesecake with jelly beans & you’re all set! Beat cream cheese and sugar in medium bowl with whisk until well blended. Stir in COOL WHIP. Spoon into crust. Refrigerate 3 hours or until set. Top with jelly beans just before serving. Yeah, that’s our irascible but loved Hannah Jackson McIntire. If you haven’t already but would like to, you can read about her romance with her Wolf shifter mate, Ian “Mac” McIntire, and their son, Liam, plus all the Moonstruck Wolves and their mates in MOONSTRUCK: SECRETS. It’s still on sale everywhere for $2.99. Grab it now before it goes up to $4.99 next month. Just click on the cover for the universal link to all the stores. What’s an Easter dessert your family enjoys? This entry was posted in Writing Life and tagged characters, family, food, fun stuff, holiday, Moonstruck, recipe, Tuesday Treats. Bookmark the permalink. Oh, yum. I do loves me some cheesecake. But with the new eating healthy thing, it’s flat out. I’ll just sit here and look at the picture of it. K? LOL, Hannah’s so much fun.